The shoreline consists mainly of rocks, but with a few sandy beaches on the harbour side, by the harbour entrance, and on the ocean side. There are two car parking areas. 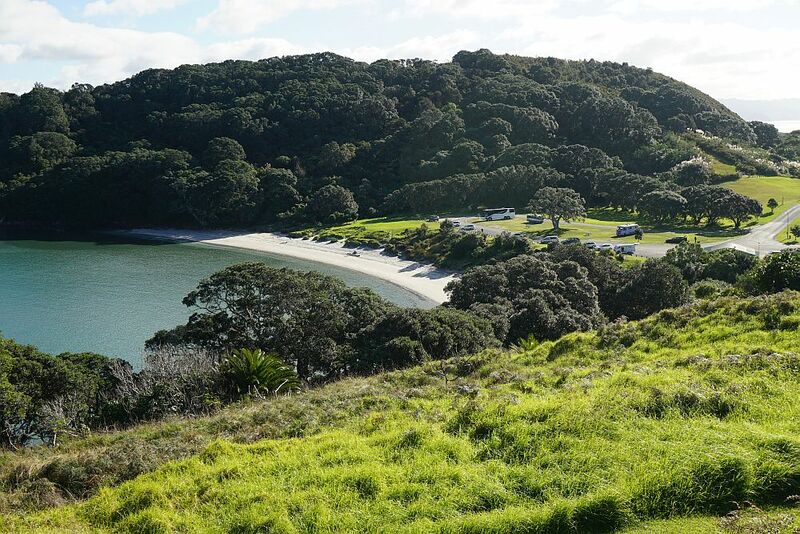 The headland car park gives easy access to Te Ho Pa and Te Kura a Maia, and the other at Anzac Bay has toilet facilities, boat launching access, and an area available for freedom camping in self-contained campervans.Unfortunately none of the tracks or pa sites are marked, and there are no information panels anywhere. The latest LINZ topographic map only shows a few of the tracks. So the walk was also an attempt to map out the tracks, both official and unofficial. 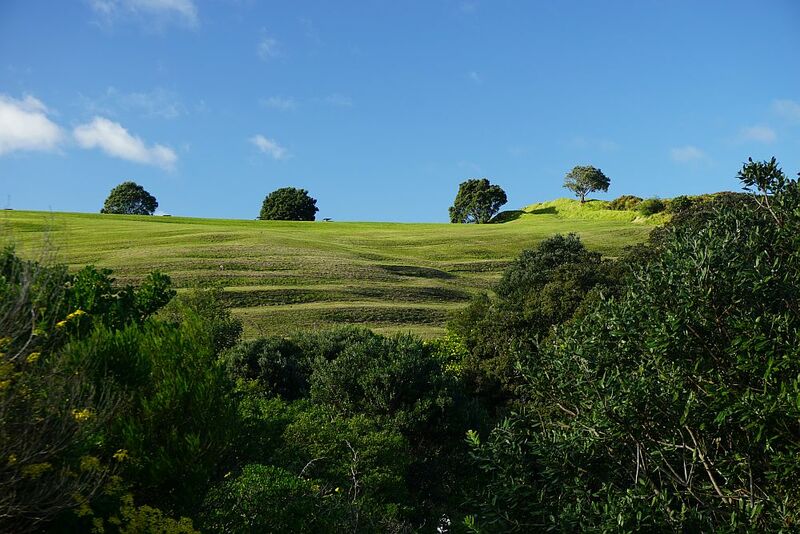 The two main hills apparently have not been named, so they will here be called western hill and eastern hill to distinguish them. Eastern hill has a trig station at the summit, at an elevation of 88m asl. Western hill has no marker for highest point, but the GPS registered the elevation as close to 80 metres. The tracks are mostly wide enough for a tractor and mower, and either grass or bare soil, which can be very slippery when wet. All the grass areas appear to be mowed regularly and the grass kept short. 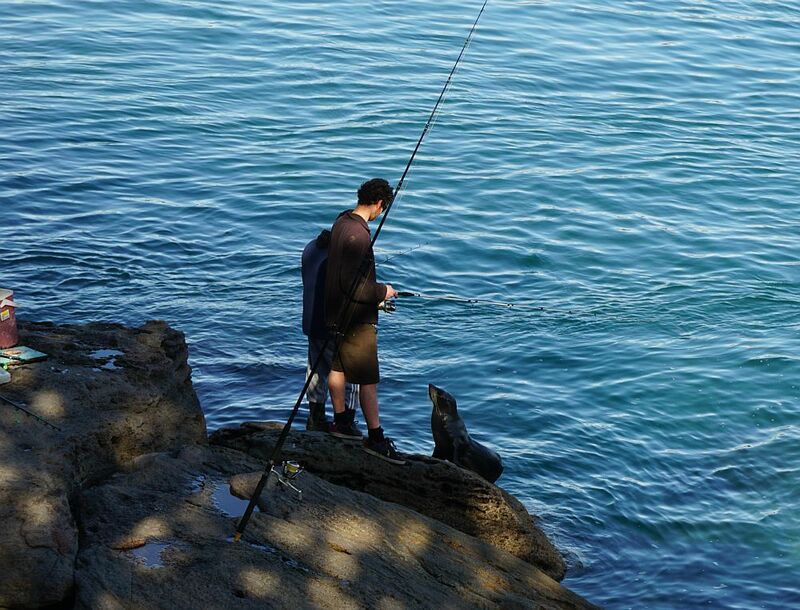 There are shorter, narrow and steep tracks leading to off the main tracks to points of interest or just to popular fishing spots. The GPS track log shows all the tracks walked, including the narrower and steeper side tracks, some of which are rocky and can be difficult to negotiate. 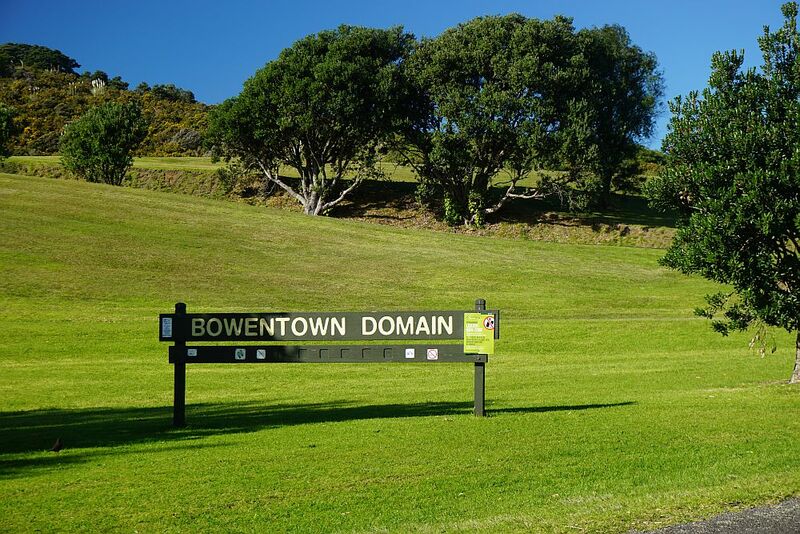 The sign at the vehicle entrance to Bowentown Domain. The road to the headland carpark turns off to the left, and the one to the Anzac Bay carpark continues straight ahead. The domain is a liquor-free zone. 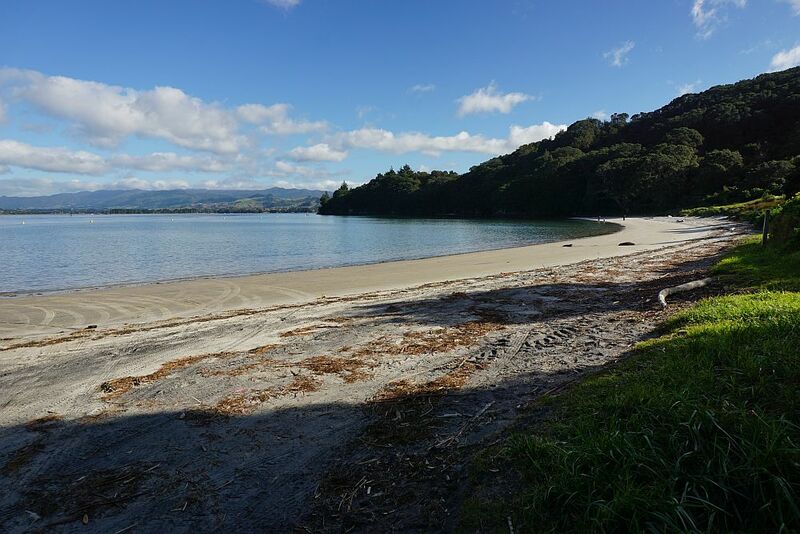 Anzac Bay with the beach and the parking area. 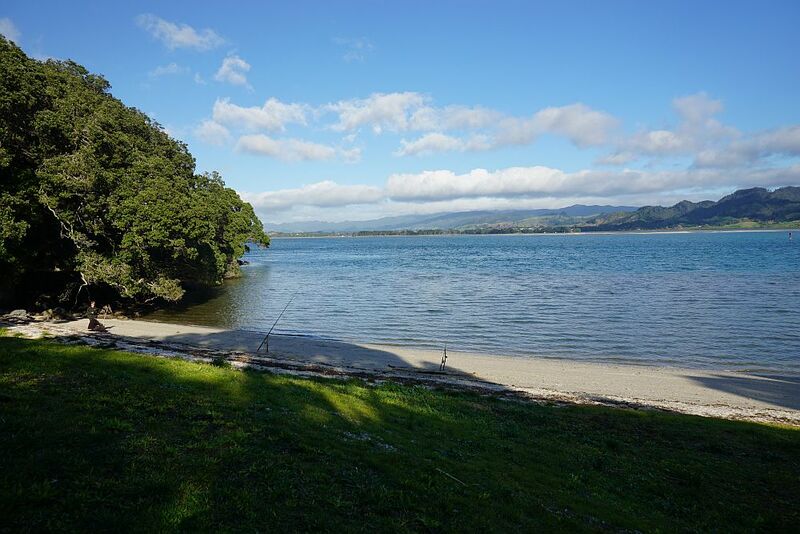 The freedom camping area is the grassed area on the far right. 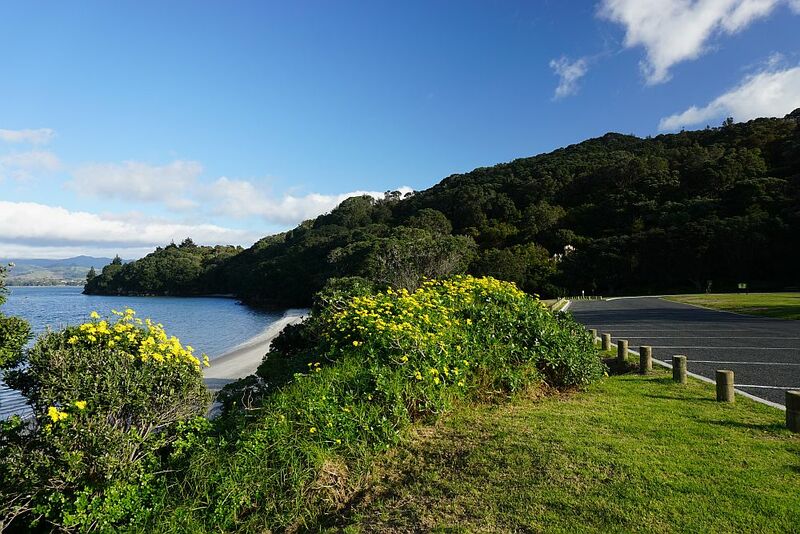 The track to Shelly Bay starts at the far end of the carpark. 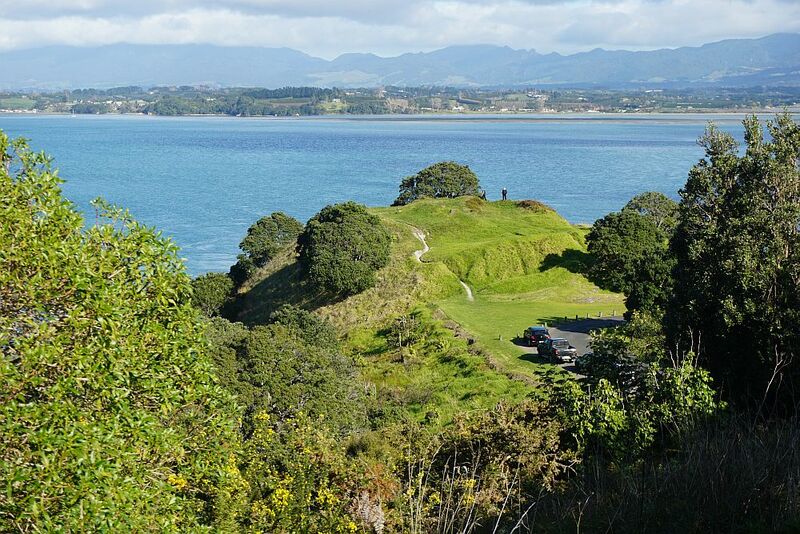 Te Kura a Maia pa site seen from the northern end of Anzac Bay. The terraces on the hillside are clearly visible, with the pa site itself to the upper right. 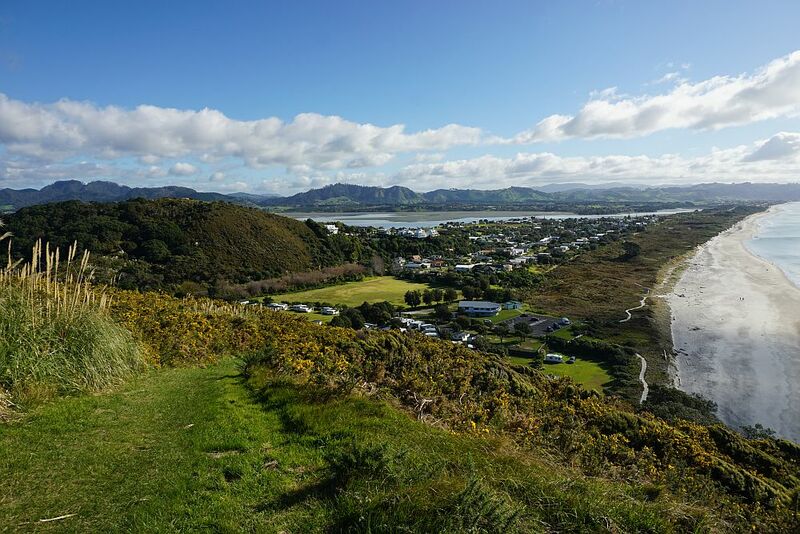 View of Te Kura a Maia from the track leading from Anzac Bay to Shelly Bay. Te Ho Pa is on the upper left of the photo. 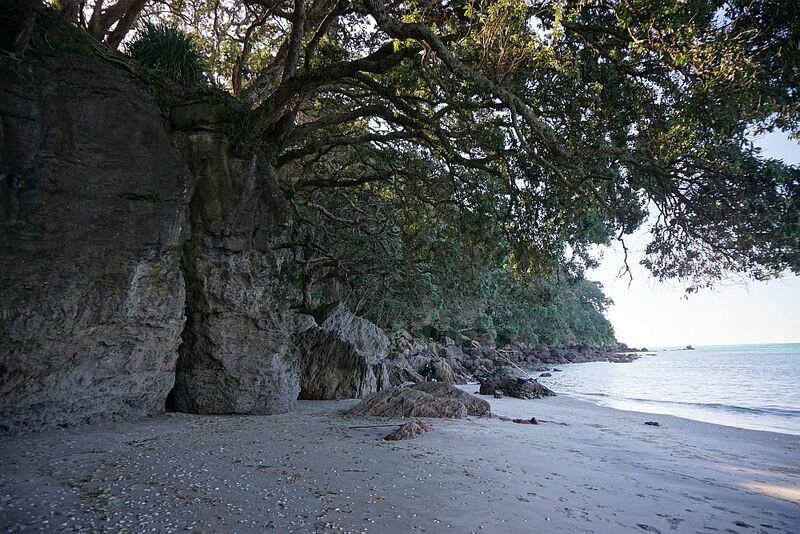 A short, unmarked and steep side track with two branches, leads off to the rocky shore at Yellow Point. 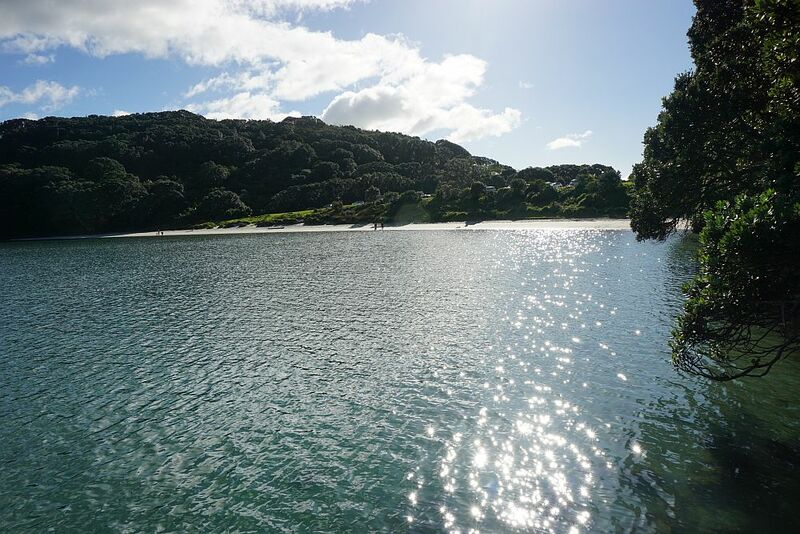 The beach at Shelly Bay. Two tracks start off photo to the right, with another starting at the far end of the beach. 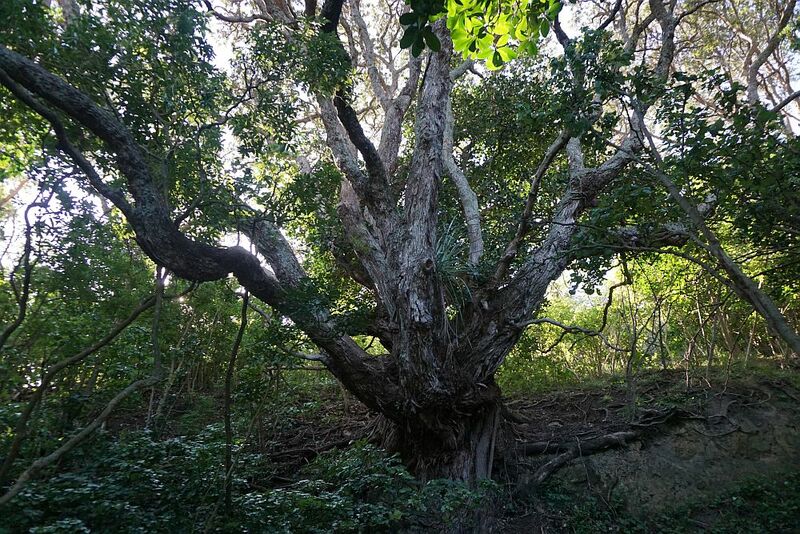 A large old pohutukawa tree by one of the tracks leading from Shelly Bay. 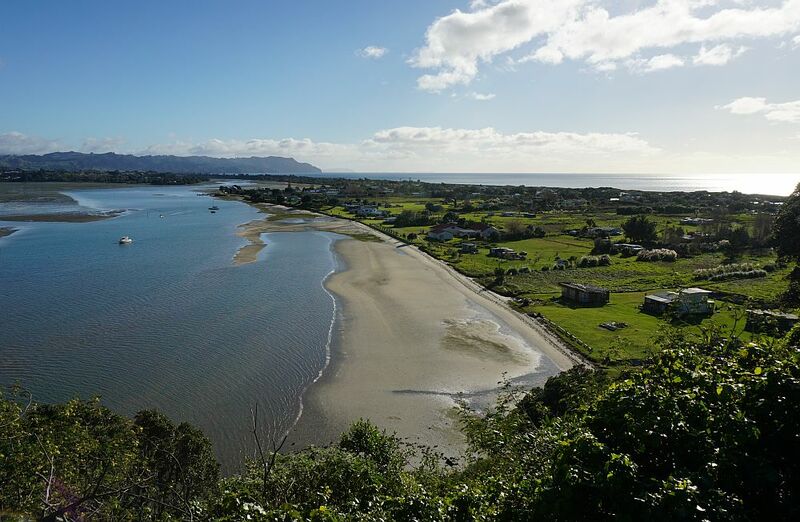 View from the track starting at the northern end of Shelly Bay, looking up the peninsula to Waihi Beach, with Pios Beach in the foreground, and Athenree to the left of the Waiau River mouth. The track continues on to an urupa or cemetery. A track to the north-west from the cemetery ends in a grass field. 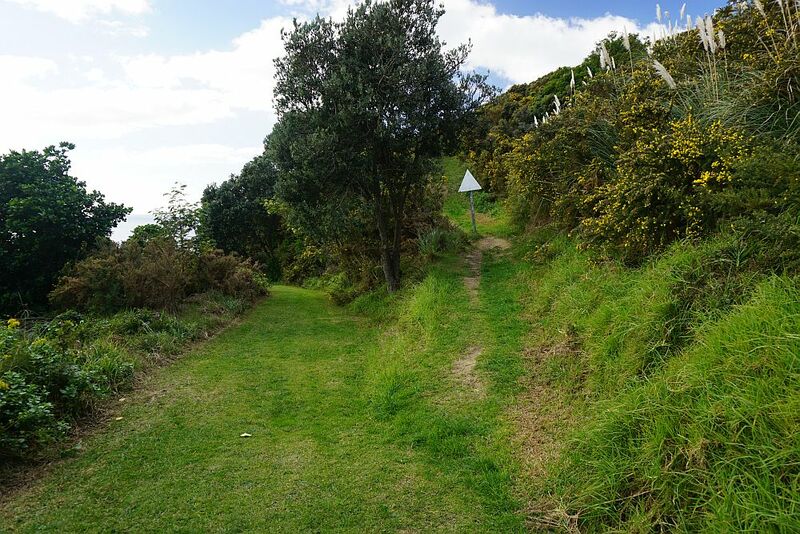 Presumably this track is used for access from the marae just north of western hill to the urupa. Another walkway, marked on some maps as leading down the hill to Seaforth Rd, is now completely overgrown and closed. 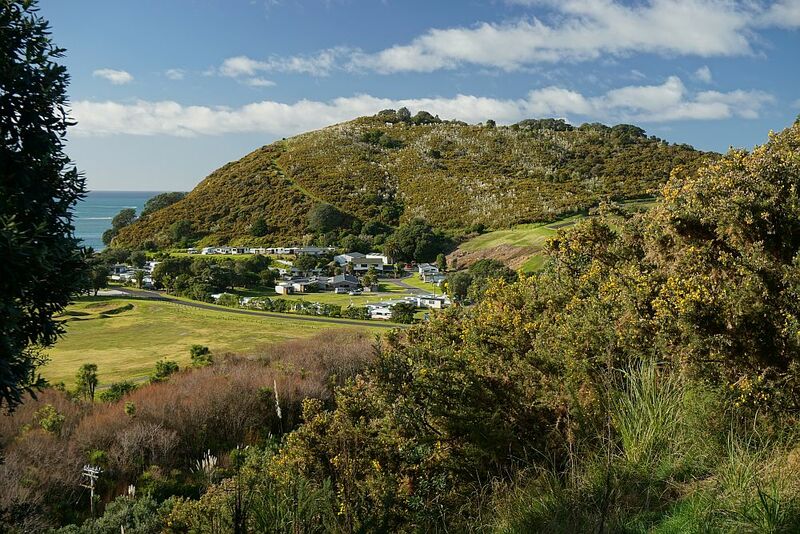 This is the view to Te Ho Pa (eastern hill) and the Bowentown Motor Camp. Most of the tracks are wide and well formed, and the grass is mowed and kept short. 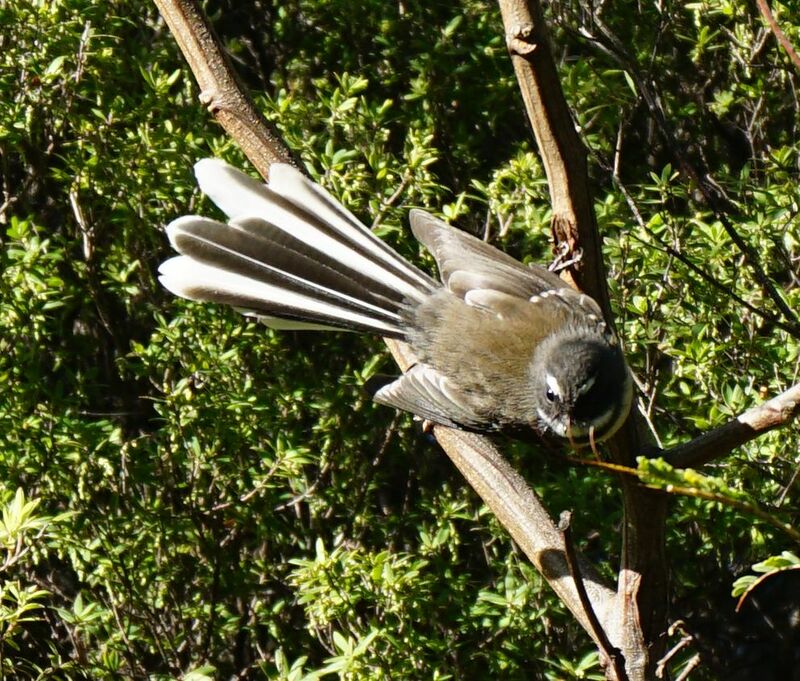 Fantails (piwakawaka) were seen in numerous locations along the walkways. 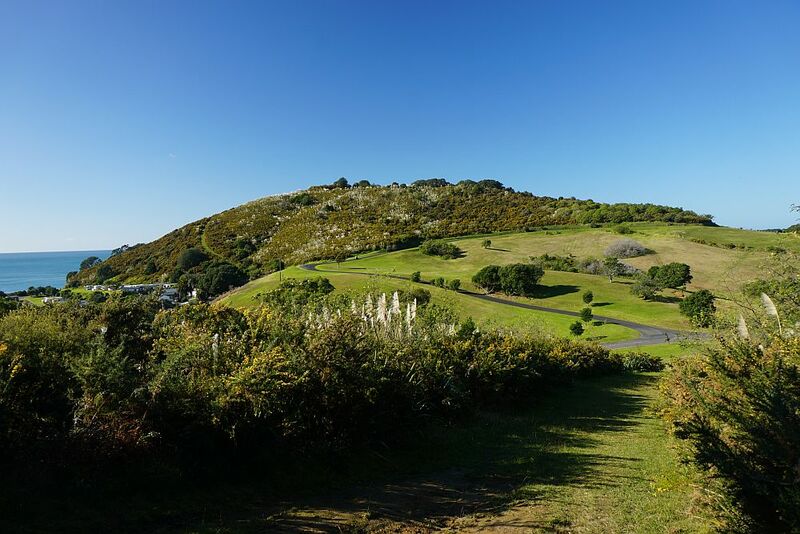 View from the track leading down from the summit of western hill to the Bowentown Domain entrance, with Te Ho Pa in the centre, and the road leading to the headland carpark winding its way up the hillside. 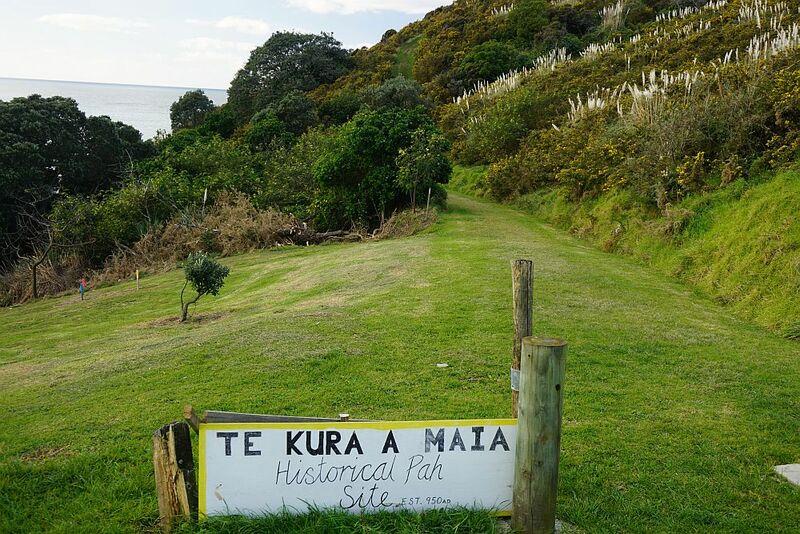 A handwritten sign at the start of the track to Te Ho Pa seems to indicate that this is Te Kura a Maia instead. 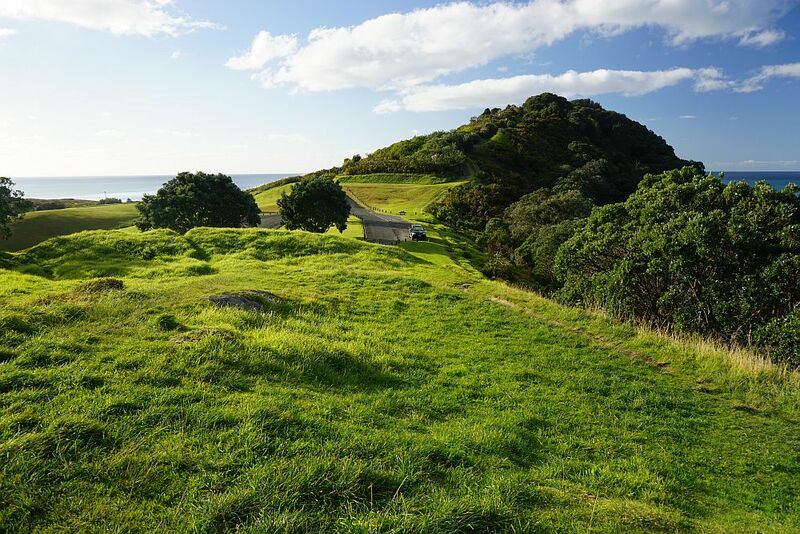 The establishment date of 950 AD, if correct, would predate the some commonly quoted migration dates from travels from Hawaiki to Aotearoa, usually from about 1100 AD an onwards. 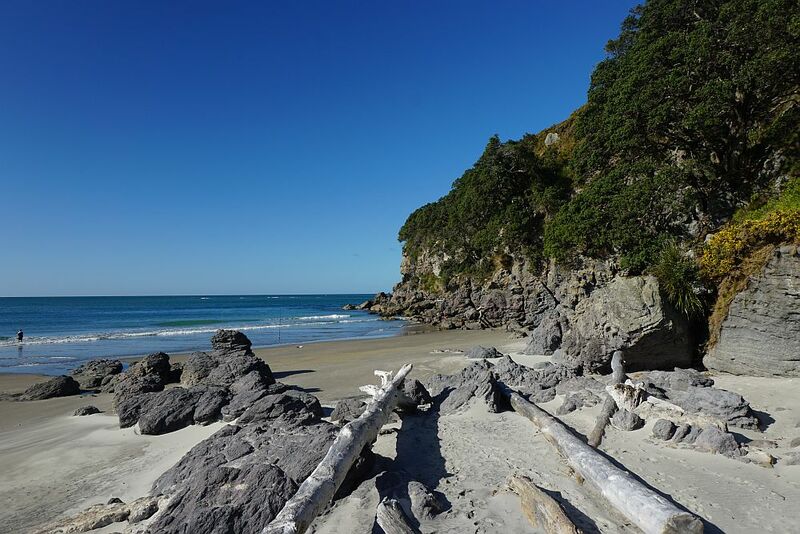 The track to Te Ho Pa goes off to the right, the track straight ahead leads to Ocean Beach and a short boardwalk. The southern end of Ocean Beach. Boardwalk at southern end of Ocean Beach. 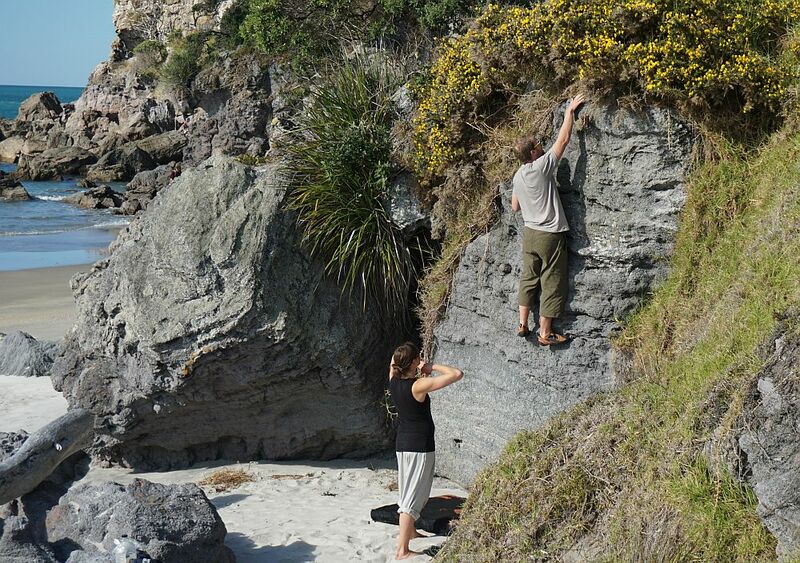 Tourists getting some practice at rock climbing at the southern end of Ocean Beach. 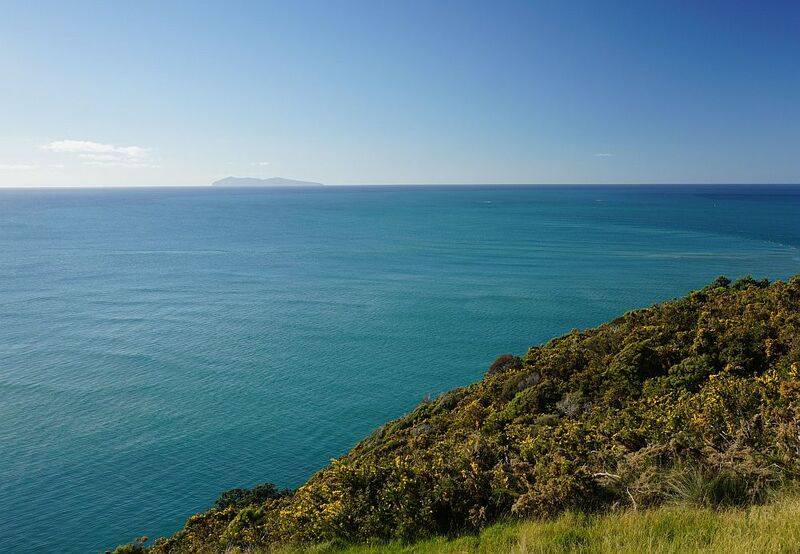 View from track to Te Ho Pa towards western hill to the left and Waihi Beach to the far right. 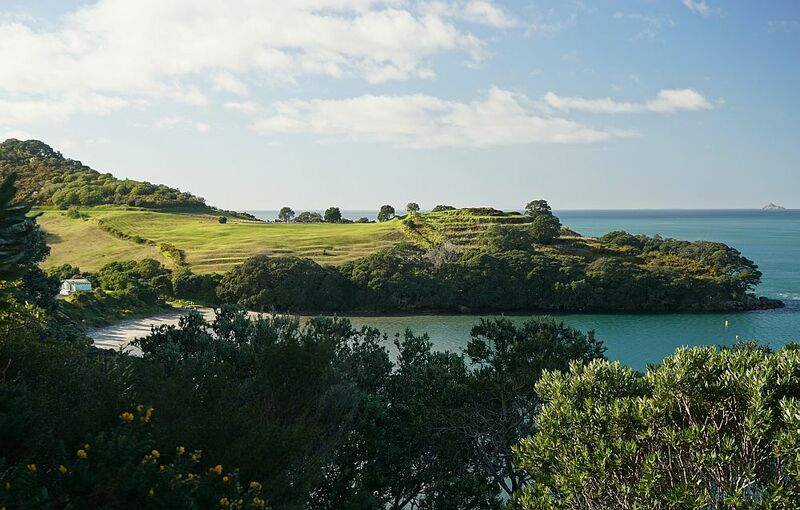 Mayor Island seen from the track to Te Ho Pa. 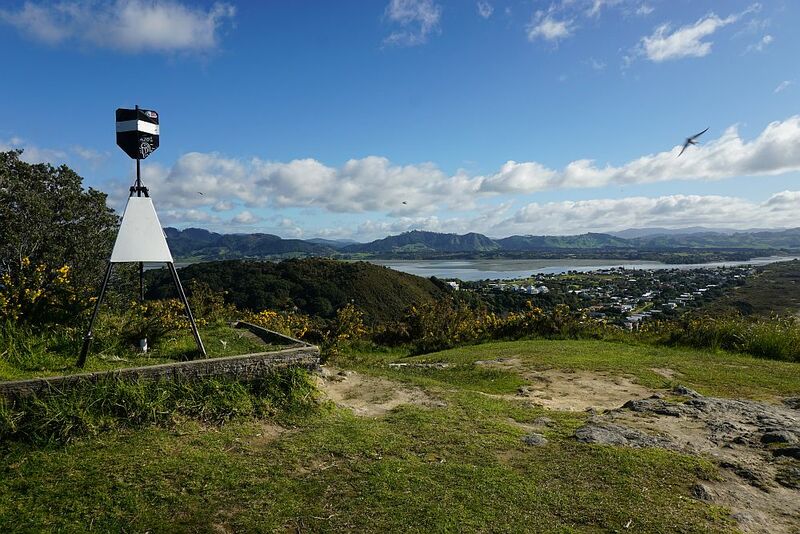 The trig station at the summit of eastern hill (Te Ho Pa). View to Te Kura a Maia and the headland car park from the track leading down from Te Ho Pa. The headland car park. 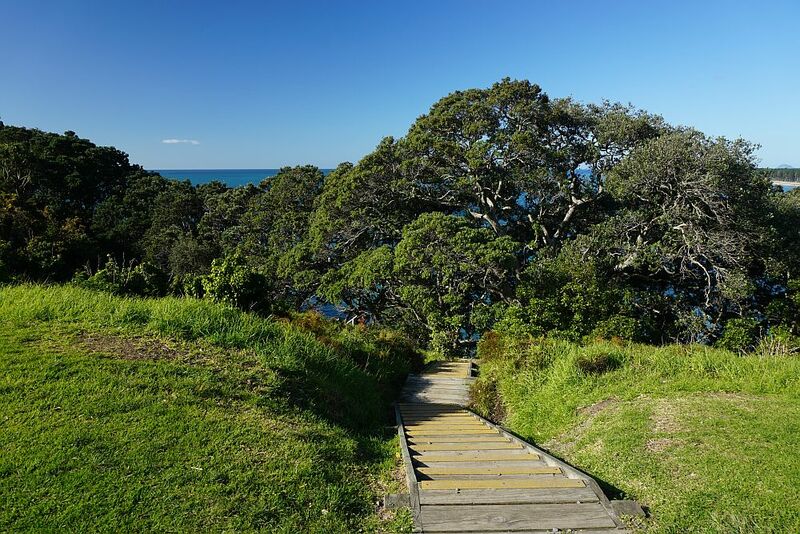 A steep track with steps leads off to the left from the carpark down to Cave Bay and beach. 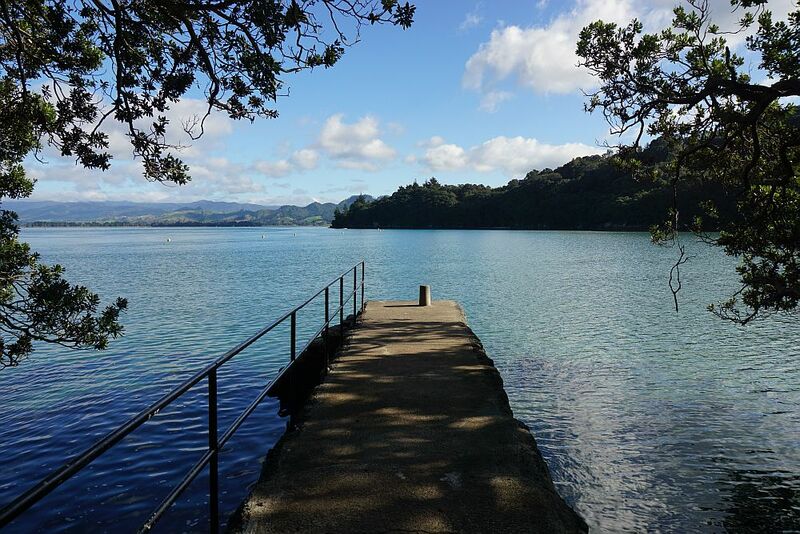 The top of the steps down to Cave Bay. Steps further down the track to Cave Bay. The steps are steep and narrow. 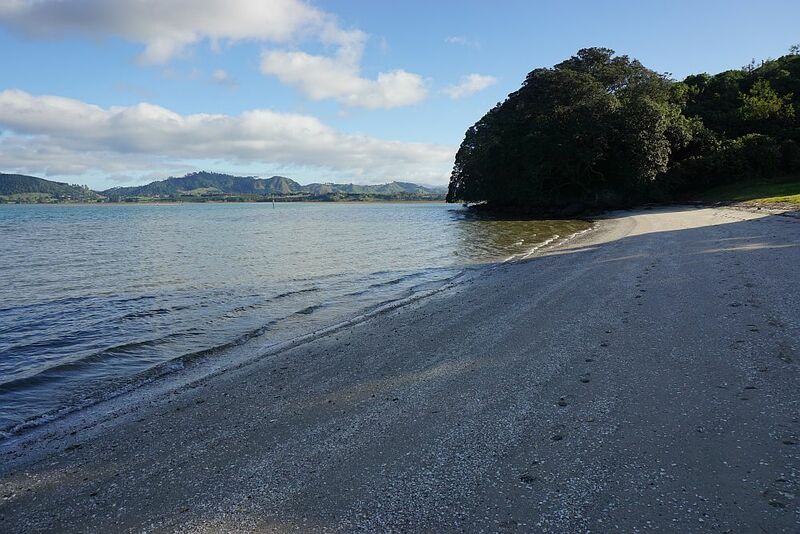 The eastern end of the short beach at Cave Bay. 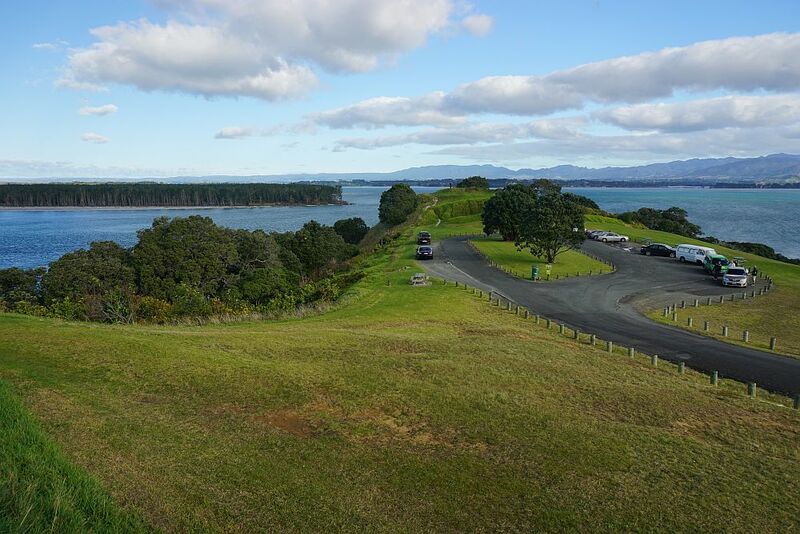 Looking from Te Kura a Maia to the headland car park and Te Ho Pa site. 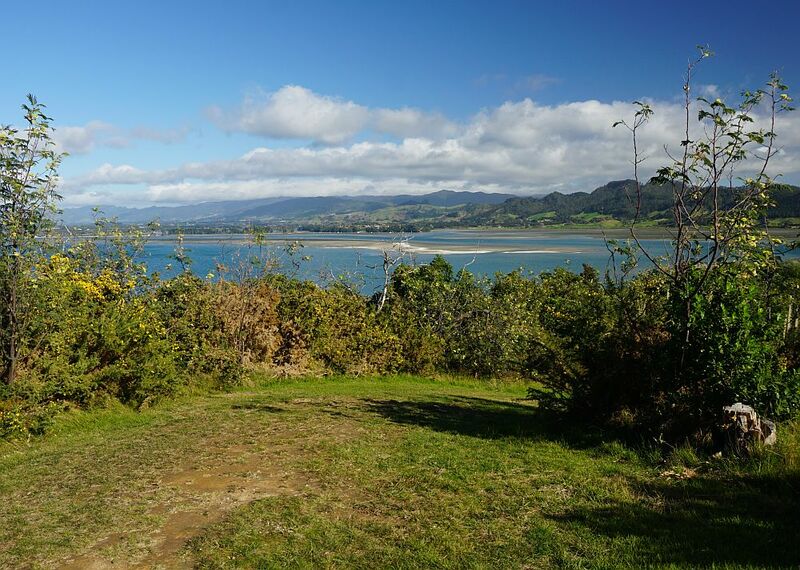 View of Anzac Bay from Te Kura a Maia. 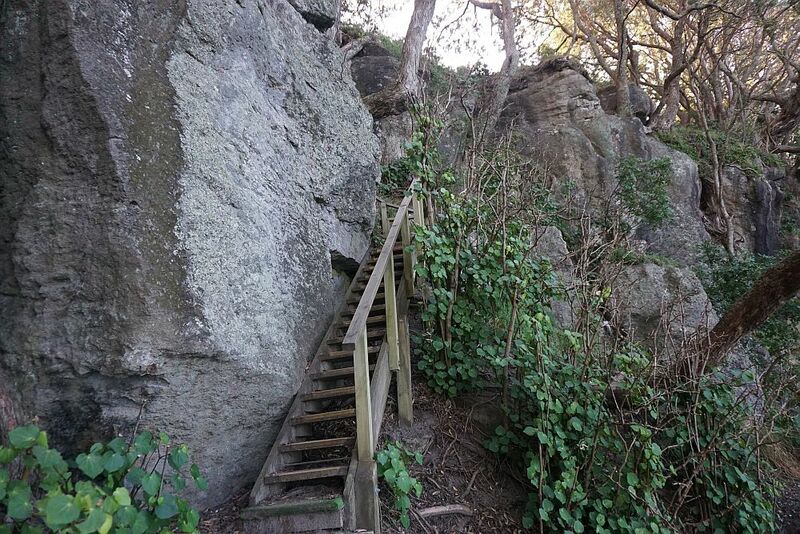 A steep and rocky track leads down to the shore at Papatu Point. 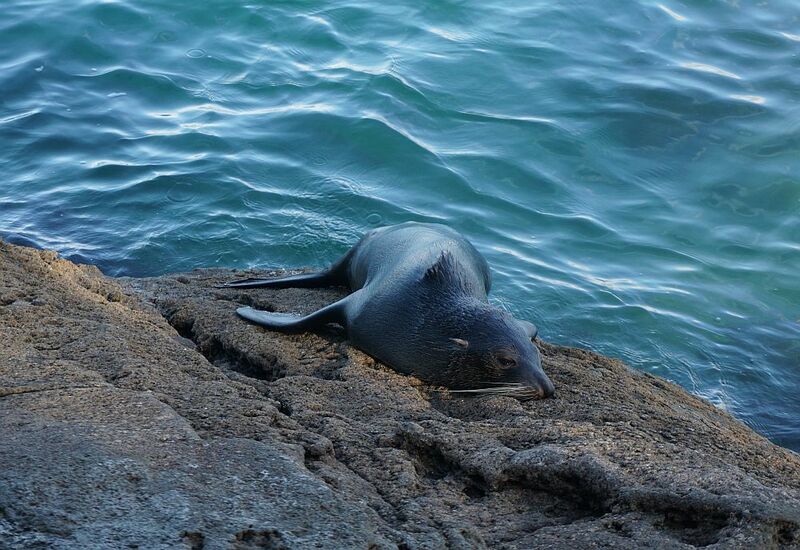 A seal was begging for food from two fishermen on the rocks. Apparently the effort required some rest afterwards. 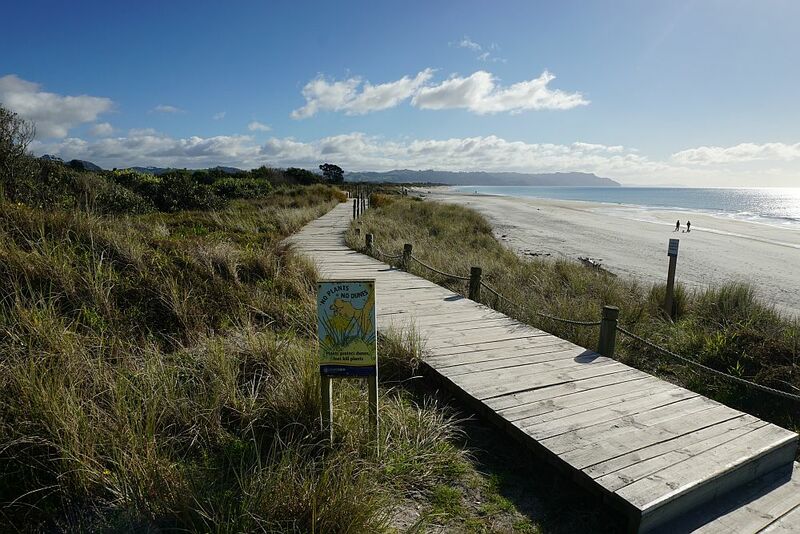 A small jetty, restored by Waihi Beach Rotary Club in 1990 near the track from Te Kura a Maia to Anzac Bay. 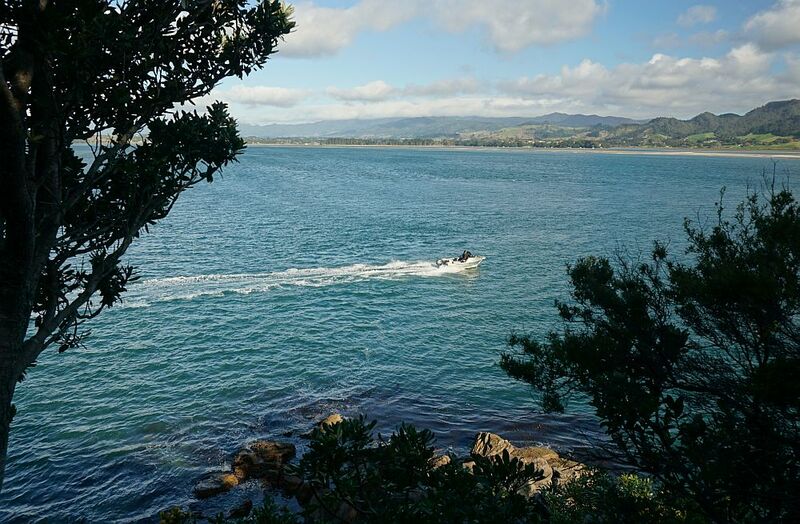 View of Anzac Bay from the jetty. Anzac Bay beach seen from near the boat lauching site at the southern end. 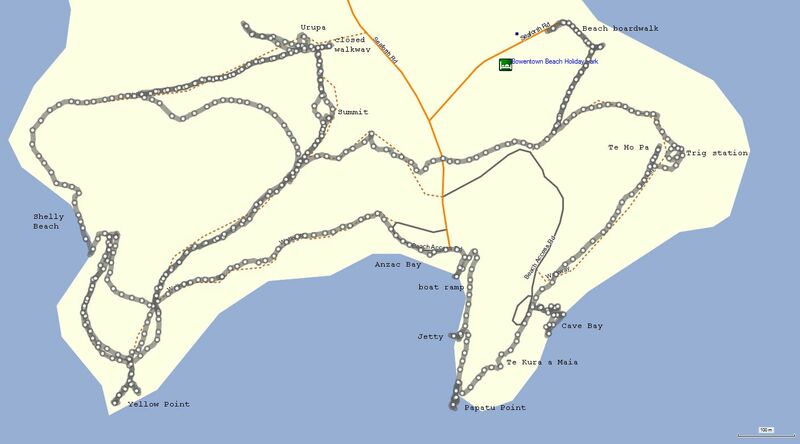 The GPS track log shows all the tracks traversed on this walk, with the main points of interest named. Total walking distance was about 8.5 km, and total time almost 3 hours. 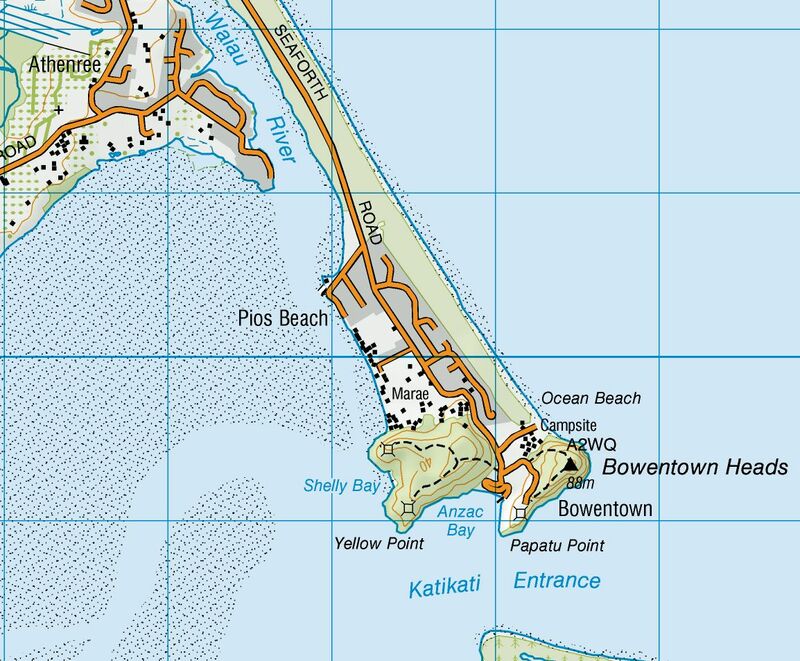 Excerpt of LINZ topographic map showing Bowentown. The tracks were walked on June 27 and 28, 2015.